Better bus service likely for Roosevelt Blvd. They'll have a new look, a new route, and fancy new stops, and if all goes well, SEPTA's express buses on Roosevelt Boulevard should be up and running by fall. The Boulevard Direct Bus is just a proposal now, but is high on SEPTA's priority list for 2017, officials said. It would stop at only six locations along the 10-mile route between the Frankford Transportation Center and the Neshaminy Mall. It should provide travel 30 percent faster than the 45 minutes it takes the Route 14 bus to traverse the same route, SEPTA officials said. Ridership estimates for the express route weren't available Wednesday, but the Route 14 bus moves about 12,000 riders each day along 60 stops. If it happens, every 10 minutes during rush hours, and every 15 minutes the rest of the day, riders should see 60-foot-long buses able to hold about 85 people each, said Steve D’Antonio, SEPTA’s manager of city service planning. The six stops between the two termini, Cottman Avenue, Rhawn Street, Welsh Road, Grant Avenue, Red Lion Road, and Neshaminy Interplex, are all getting new bus shelters that will also service the Route 14 bus, which will continue operating as a local. Riders on the express would be able to switch to a Route 14 bus without paying a transfer charge, officials said. The express route stops were chosen because, D’Antonio said, 47 percent of the people using the Route 14 bus board or disembark on one of those stops. SEPTA has budgeted $2 million for the work, but it will likely cost less, he said. Roosevelt Boulevard has long been a target for improved mass transit, with years of proposals for subway, light rail, and bus rapid-transit service never reaching fruition. Meanwhile, traffic has swelled to 90,000 vehicles a day. Between 2011 and 2016, the 12-lane, divided highway saw about 3,000 crashes, according to city data released last year. Those resulted in more than 50 fatalities, 20 of them pedestrians. SEPTA is looking to heavily promote the express route before it begins with the hope of enticing some of those drivers out of their cars and onto a bus, D'Antonio said. The buses themselves may also make the road safer, said Mike Carroll, deputy managing director of the city's Office of Transportation and Infrastructure Systems. People on foot have been known to dash across Roosevelt Boulevard in an attempt to make a bus. He said he hopes that the frequency and reliability of this service will make people more willing to wait for the next ride to come along, rather than risk a run through traffic. "People who are feeling desperate in that situation are making bad decisions," Carroll said. The city is conducting a three-year study on Roosevelt Boulevard that led to the Boulevard Direct Bus plan, Carroll said. This may be an intermediary step, though, he said. Other options are being evaluated, including the possibility of lanes reserved exclusively for buses. The express bus proposal was the most ambitious among several bus route changes that SEPTA proposed Wednesday afternoon at its Service Plan Open House. 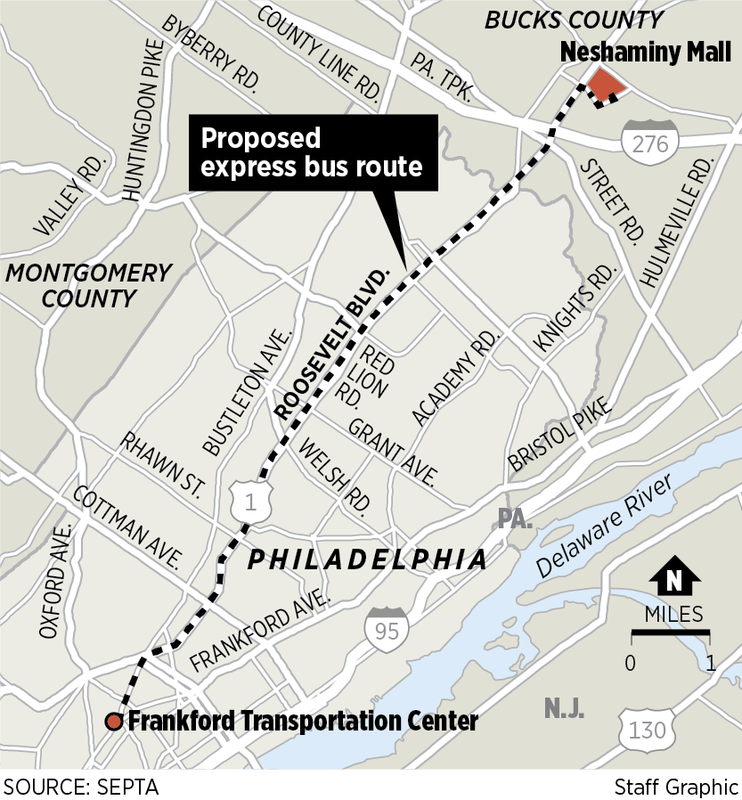 Other projects proposed include an expanded Route 49 bus that would travel between Fairmount Park and Grays Ferry, with stops near Eastern State Penitentiary, the Barnes Museum, and Logan Circle; a shortened Route 99 between Norristown and King of Prussia; an altered Route 132 bus in Bucks County; and more direct service between Norristown, Oaks, and Phoenixville on Route 131. The proposals will all be the subject of public hearings in the spring and will require board approval.